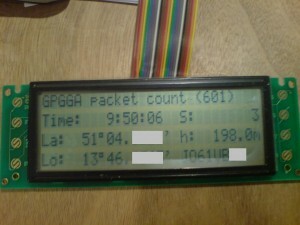 I continued to hack my AVR software that displays GPS data on a 4×27 character LCD. Now the software converts all the data into number format and uses this data to write to the display. The advantage is that you might do some calculations with this data. out to the UART again. For that it is possible to give the data to a existing APRS tracker or to the PC. So far i saw no data loss at a speed of 4800 baud.